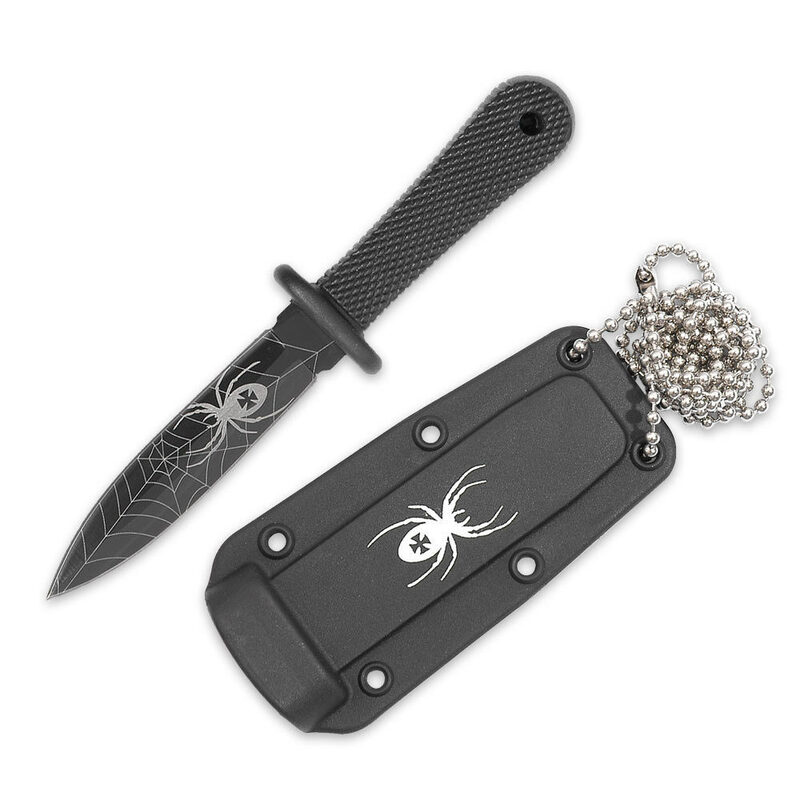 This Black Widow neck knife features a full tang construction of black-coated AUS-6 stainless steel with a razor sharp 3" blade. The textured handle is constructed of black ABS for that fierce look. The impact resistant ABS sheath holds the knife firmly in place and includes a neck chain for lightweight transport. Not a boot knife, but a very small neck knife. Still, it's well made and easy to hide. Its nice and sharp but to hard to pull out of the sheath it should come with button or switch i cut deep into my pinky just trying to pull it out safely. Might need stitches :/. Mind you i am a 16 year old. I would not recommend for 18 or younger. Nice little knife and easily hidden. Hard to get out of the sheath, careful or you'll cut your fingers or shirt lol. Needs a leather/nylon thong instead of the easily broken chain. Nice tiny thing, for the price. As durable as one would expect. Superb grip. Needs sharpening. Also, it's smaller than I thought. Mine was quite difficult to remove from the sheath. All in all, a good BOGO $10 knife. Not a bad little knife for inclusion in small emergency kits. Taped a cerro rod type fire starter to sheath. Sparks well. Won't fit in an A...toids can type kit,but can be attached by chain or elastic on outside. Also good for scraping tinder, or can be attached to staff for spear. Two edges for use for appropriate different jobs-ie, one for rough work, other left for fine work. Small enough to drop in pocket, wear on chain, very light and compact. Needs sharpening, but if you can't sharpen knife, you probably need to stay in the house. Originally bought one to give to a friend who is pregnant and vulnerable while she walks to her car, but couldn't carry her gun (even with permit) into Govt building where she works. She was tickled with it. Tough lady-works for Parole Board, so she was aware of dangers on street, and carries it as a backup to pepper spray. DID ANYONE BESIDES ME, SEE THE GERMAN IRON CROSS ON THE SPIDERS' BODY?? WHY IS IT THERE? DON'T ASK ME, I HAVE'NT A CLUE. NICE LIGHT LITTLE DAGGER-SHAPED NECK KNIFE THAT DOES'NT FALL OUT OF THE SHEATH ALL THE TIME. II'S VERY POINTED AND SHARP ON TOP AND BOTTOM. BESIDES ALL THAT, IT'S CUTE. NOW, ALL YOU ORANGUTANS AND TREE=HACKERS MIGHT FIND IT DEFICIENT UNLESS YOU'RE DEALING IN VERY SMALL TREES. I IMAGINE A ZOMBIE WOULD TAKE IT AWAY FROM YOU AND PICK YOUR FLESH OUT OF HIS TEETH WITH IT. THAT'S MY REPORT, CAPT, SIR, DAN BELEW, SGT. CMDR FIRING SQUAD. I LOVE THIS NECK KNIFE! I BOUGHT 2 OF THEM. I have bought several other neck knife off of BUDK, but this one is by far the best! Its a sweet knife! Nice little knife for the price. It's in my boot daily. A good knife for the price. It was a great knife but it's really light and not that sharp nor was it the size I was expecting for a knife. To me I see this knife to a little toy but then again I'm an avid knife collector. But not that bad of a knife for starters self deffence.